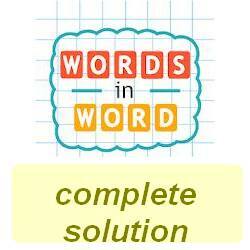 Words in Words Game All Level Solutions and Hints are available on one page. If you want some answers them scroll down to the page. Words in Word game has a lot of levels with more difficulties and challenges but if you need any help with any level then you are on the right page. Makeup words from the letters of another word given to you on the level. Guess the word and next level will be waiting for you to guess the next word and if you are not able to slove any level then I’m here to help you with it. Words in Word level 1 Answer: Bug, bear, argue, grab, rage, rub, era, beg, bar, rag, bag, babe, barge, rug, bra, gear, bare, brag, grub, ebb, ague. Words in Word level 2 Answer: Atom, foam, haft, math, moat, moth, oath, fat, foh, ham, hao, hat, hot, mho, tom, ohm, oat, oft, tho, mat, moa, ah, at, om, to, ta, oh, ho. Words in Word level 3 Answer: Means, ament, antes, manes, manse, mates, means, meant, names, steam, teams,nets, east, sent, name, meat, teas, sane, team, mean, seat, meta, seam, mats, etas, mate, tens, amen, stem, mans, mane, ants, ante, tame, tams, ems, set, ten, tea, sen, net, men, met, eta, ate, eat, sea, tas, say, ant, an, at, me, as,em, ae. Words in Word level 4 Answer: apace, apeak, apnea, pecan, cane, nape, kapa, pane, kana, acne, knap, kane, pean, peak, cape, peck, neck, neap, pace, paca, cake, pack, ane, ana, can, ape, nae, nap, pen, pea, pan, pec, ken, an, pa. Words in Word level 5 Answer: Rogue, rouge, grue, ogre, grub, urge, bore, goer, robe, roue, rube, burg, berg, gore, euro, rob, roe, bro, our, gob, rub, reb, reg, bur, rug, rue, ore, orb, or, be, go. More levels will come out soon.